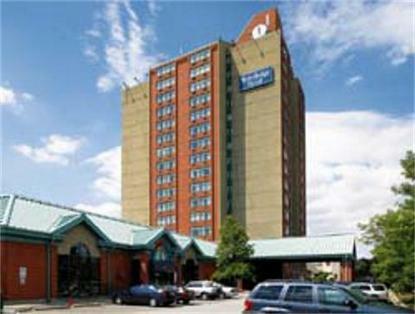 The Travelodge Hotel Toronto Airport (Dixon Road) is located at the heart of the airport strip. This is the closest Travelodge to Pearson International Airport. The hotel is a true full service facility that mixes luxurious accommodations and superb service at an excellent price. The Hotel Lobby and Executive Rooms are Newly Renovated. It is in close proximity to shopping, International Centre, Congress Centre and Complimentary Shuttle to/from Woodbine Race Track/Airport available 24 hours. Our hotel is ideal for the business traveler, with four newly upgraded executive floors, with separate access to the executive lounge 24 hours a day, full size work desk, complimentary wireless internet, in-room Refrigerators, and 25 inch color TV. The hotel also features an indoor pool, fitness room and separate dry Saunas in the men's and women's changing rooms. Wireless Internet is available throughout the property. Pets are Allowed at a Charge of 25 dollars per stay, Parking is $11.00 a night plus taxes per car. Casey's Restaurant and Lounge offers a casual breakfast, lunch, and dinner menu. Furthermore, we feature 7 meeting rooms capable of accommodating groups from 6 to 150 people. Catering for the event can be handled on site to meet any menu items requests. We look forward to having you as our valued guest.Contact us at: reservations@travelodgedixon.comor Call direct #1-888-483-6887 or for our Central Reservations Line, #1-800-578-7878.